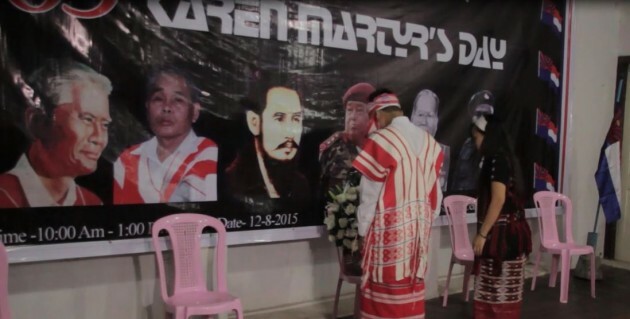 For the second year running the Burma’s government allowed Karen people to commemorate their Martyrs’ Day in Rangoon. The 65th Karen Martyrs’ Day was held at the Judson Hall on August 12, 2015. This year’s event organized by Karen youth groups packed out the Judson Hall including representatives of the Karen National Union. Organisers said many people did not attend as under the existing laws the KNU is regarded as illegal and could be arrested under Article17/1. Padoh Thamein Tun, Executive Committee Member of the KNU who attended the event spoke to Karen News about the event. Naw Say Moo Paw, a Rangoon based Karen Singer (a.k.a) Kabyar Bwe Hmu told Karen News that she is grateful to be able to attended the event as it is a significant day for Karen people. For young Karen people growing up in government controlled areas and studying at government schools, they know little about the assassination of the Karen’s charismatic leader, and KNU former president, Saw Ba U Gyi, who was murdered on August 12, 1950. This day is now designated to commemorate his death and all those soldiers and Karen people who died in the armed struggle for self-determination. Naw Hsa K’pru Moo, Karen Youth, who attend the event told Karen News that the commemoration is an opportunity for her to learn about Karen Martyrs and the Karen struggle. Saw Tun Tun, a coordinator from Youth Circle who took part in the organizing of the event spoke to Karen News. Padoh Thamein Tun, said that by commemorating Karen Martyrs’ Day in places like Rangoon would bring many positive outcomes – it is an opportunity for the Karen community on the border and inside the country to be reunited and to exchange experiences and the event allowed them people who don not know about Karen Martyrs’ Day to talk about Karen history. Padoh Thamein Tun said that it is important for youth to take up the Martyrs unfinished work and fulfill it.